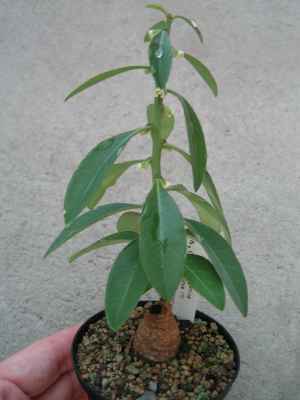 This member of the Euphorbiaceae family was described by Nicholas Edward Brown in 1913. It is found in north eastern Tanzania, growing in a well drained soil with some water and some sun. The caudex can grow to seven centimetres in diameter, the annual stems up to 45 centimetres height. The flowers are white to crème coloured.